In the December 2008 issue of Windows IT Pro magazine, Michael Otey publishes part two of his VMware ESX/Microsoft Hyper-V comparison. From the VMware side of the world, I felt the article was well written, fair, and mostly accurate, however, there are a few things that I wanted to point out to minimize the confusion for those still trying to decide which hypervisor and feature set is best for them. For most of the article, ESX is referred to as ESX Server. VMware dropped the word “Server” from their bare metal hypervisor a while back. ESX Server is merely ESX or ESXi and should not be confused with VMware’s free hosted product VMware Server. Page 22 mentions the most noticeable missing feature from the Virtual Infrastructure Client is a native Windows Explorer-like file manager and direct connection from host to host. This is incorrect. 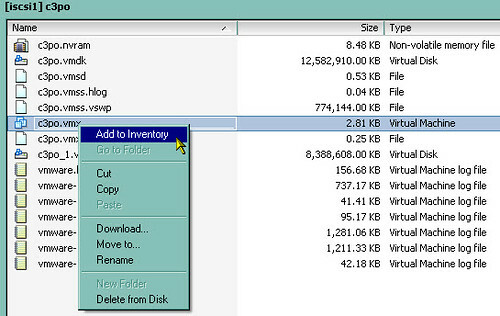 From the VIC, you can either double click or right click on any datastore seen by the host and choose “Browse Datastore”. From the Datastore Browser, files and folders of the VMFS volume structure can be copied, cut, moved, renamed, created, deleted, and downloaded to the desktop. To address the host to host communication piece, the scp command can be used in the service console (COS) of an ESX host to copy files to or from another ESX host (ok, it’s not pretty, but it’s an option that does exist and I’ve used it many times). Michael goes on to say the VIC doesn’t provide the ability to copy or clone VMs. I grant Michael that in this example the VIC is not as intuitive as the other VMware hosted product management consoles which provide the user menu driven options to clone VMs, however, as I explained in the bullet above, the Datastore Browser will copy VMs which accomplishes one part of a manual cloning process. Another cloning step I will talk about in the next bullet. Lastly, Michael explains he doesn’t get a graphical option to register VMs. Once again, using the Datastore Browser, we can right click on the VM’s *.vmx configuration file and choose “Add to Inventory” which registers the VM on the host (this is equivalent to the vmware-cmd -s register <config_file_path> command in the service console). This appears to be a simple case of Mr. Otey missing the Datastore Browser feature in the VIC which I’ve shown does exist and provides great utility and improvement over the MUI based file manager we had in the legacy ESX 2.x days. The Datastore Browser is a direct result of VMware listening to and responding to end user feedback stating we weren’t satisfied with using out of band 3rd party utilities like WinSCP for ESX host file management. Michael’s conclusion was a five-diamond rating for ESX over Hyper-V. He goes on to recommend ESX to midsized-to-large businesses looking for performance and manageability. With ESXi offered for free from VMware, I think he is missing the value of performance and manageability for small businesses as well. Speaking of Windows IT Pro magazine, little known fact, I was the winner of the Reader Challenge in the April 2000 issue. Back then, the magazine was called Windows 2000 Magazine (and before that Windows NT Magazine). Back in the Windows NT days, the magazine was as thick as a 20,000 family telephone book. These days, the magazine still has some good articles like those written by Michael Otey, but sadly it has dwindled to 65 pages, the majority of which seem to be filled with ads and they still boast a $54.95 annual subscription cost. I’m not sure how they sleep at night. $55? I pay $20. I let my subscription expire and wait for the $20 renewal notice. I may miss an issue waiting for this, but they are so kind as to send me the ones I miss too. hello, may be you can help me with a problem relationated with VIC. Recently I have moved a VMachine to an storage to another. The problem is that in the inventory, the machine apears to be in the old datastorage, so, I removed it from de inventory. Then I used the VIC, as your captures above, to add to inventory from de right datastore, but the option “add to inventory” is disabled and, obviously, I cannot use it. Do you have any idea about what’s wrong here ? The only reason I can think of offhand that “Add to inventory” is disabled is that you are right clicking the wrong file in the datastore browser. Please be sure you are right clicking on the .vmx file to add to inventory. or in the case of a template, it will be a .vmtx file. yes Jason, you are right, I found the problem. There was not an *.vmx file… so I had to create a new *.vmx file and it works correctly right now.